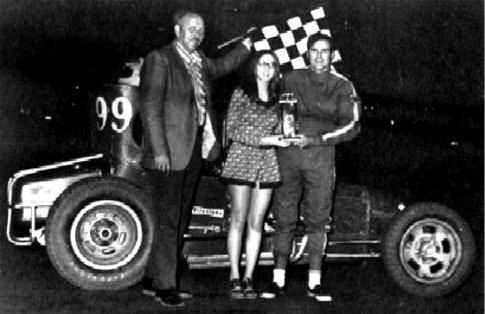 Photo contributed by Brian Conn.
Grady Wade from Wichita in the Jelly Wilhelm #99, after a victory at Topeka on May 5, 1972. I beleive this is also the last t-sprint car to race at Manzanita. Jelly took it out there and Harold Leep drove it. It is in a copy of Open Wheel. I believe it was the story on Harold. I have the magazine. Harold is standing next to it with one foot on the rear tire on the straight away. 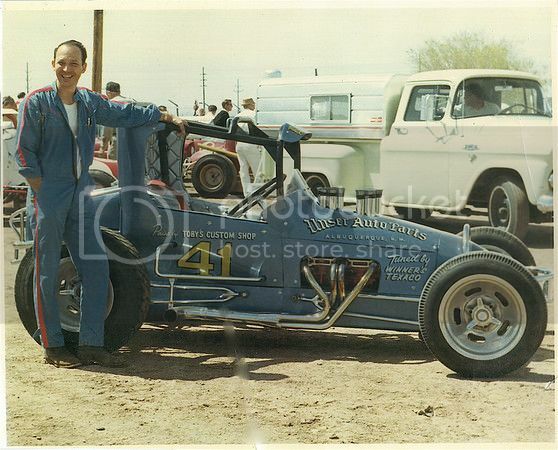 Warren, (somewhere in Texas) ..This is the car, the race & the driver I was referring to. 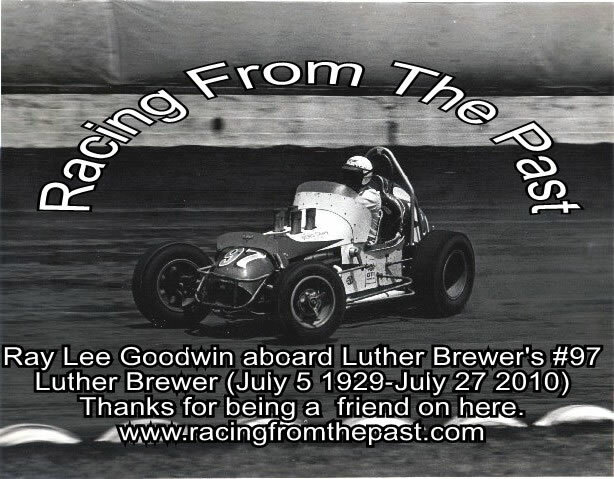 Thanks....Luther...I think this car was at the 64 Labor Day Meet at 81 Speedway except it was red. Jelly told me he still has this car, although it's in peices now. But still buildable. This is a beautiful race car, it also reminds me of what I called a T-bodied modified during the early 1960's that ran here in Lawton. The car, I think was owned by R.D.Wright and driven by Johnny Winchester from Dallas. I remember it being painted baby blue with yellow numbers which was #45. It also had 1960 or 1961 Ford Falcon front fenders for the hood. It was sponsored by Pal Waffle Shops in the Dallas area. 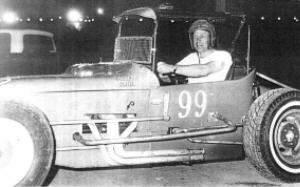 It was one of the first T-bodied modifieds in our area. I know it ran in 1964 here in Lawton. I wonder if any one in the Dallas arearemembers this car or has photos of it. The only photo I have is in my memory. I remember a story on John and this car in hot Rod mag. mid to late 60's the car's color was 7up bottle green, and shine yes it did. Jelly told me this car won a feature at every race track it ran but one, where it ran second. He won so many up at Lincoln, Neb. They said just send him the money so they won't have to drive up there. If their ever was a car that needed to be restored this one of them, maybe some day. That is Wylan Cantrell in the hat, Smith in track suit, Jack Walker & Grady Wade in Driver suit, Harold getting out of car. This car was built after Jelly seen the photo of the Twister in a Mag. There were only a handful of kickbutt T-coupes back then, Luther yours was one of them. If one didn't know any better from the history, he'd be confused as to who started this style. Of course it's the car underneath that makes the difference. Brian,...I know the Twister, Golden Greek & Jelly 99 cars were before mine & I thought that was the perfect super modified. A sprint car with a Model T replica body on it. Model Ts never ran so fast !! Mine was nearly all home made, the bird cages, brake system, front axle, radius rods, stablizer bar. It had Buick aluminum brakes on the rear. I made the tail of fiberglass by making a model tail out of a kerosene space heater the shape I wanted then the fiberglass. Would you believe the rear torsion bars were made from Ford passenger car drive shafts ? They were. I even made a wide wheel for the right rear with gussets you see in the picture on here. It broke the the first week & I purchased the Safety Racing bolt together aluminum wheels & never, ever ran another steel wheel. It was enjoyable to say the least.